We welcome you to experience one of Marrakech's longest established and most elegant riad hotels. 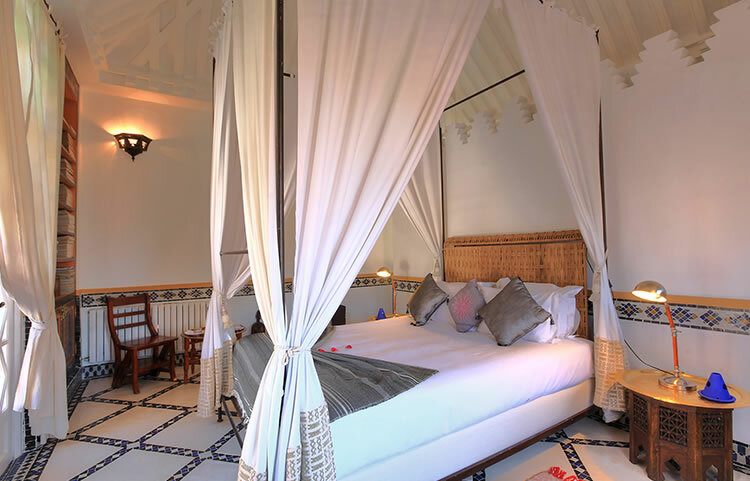 Riad Kaiss is a 16th century building which was once the home of Sultan Moulay Yacoub, ruler of Marrakech. It is a traditional Moroccan riad located just steps from the UNESCO world heritage site Djema el Fna, the pulsing heart of this magical city. It was bought in the 80's by famous French architect Christian Ferre. His lifelong research and immersion in Moorish and Islamic arts inspired Ferre during the 25 year expert restoration of Riad Kaiss. He devoted his life to the project, working until his last days to bring the building back to his vision of its former glory. After falling in love with the building and its story ourselves, we knew we had to share this hidden gem with the world. After carefully modernising the building to include all the 5 star comforts any luxury traveller might desire, we opened the doors to clients seeking a home from which to begin their journey of an authentic and culturally enriching Moroccan experience. A kind of room to suit all tastes There is one superior room with twin beds. The two suites both have private roof terraces, offering romantic possibilities for private dining and relaxing. Once the Harem of the “Favourite” of Morocco's Sultan Moulay Yacoub, Riad Kaïss is one of Marrakech's longest established and most elegant riad hotels. Located just steps from the UNESCO world heritage site Djema el Fna, the pulsing heart of this magical city, Riad Kaiss is supremely well-located for the sites and sounds of Marrakech. On a quiet side street, the hotel offers guests a tranquil setting from which to explore this amazing Moroccan city. We are delighted to welcome groups and their special requirements. Our standards across all properties are consistently high, which is why so many groups have entrusted us with organizing their special occasion. Private dinners and small group meetings and retreats are defined by our commitment to superior service, food and wine. Please contact us to discuss how we can make your next gathering memorable. Our ability to accommodate larger groups across several properties makes the Riads an ideal way to combine the magic and tradition of a Marrakech wedding without sacrificing originality. We have extensive experience organizing and catering for small, medium, and large wedding parties, and are delighted to offer this service to our guests who stay with us. Please contact us for more information.